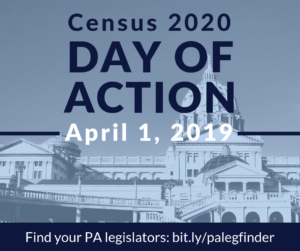 Join us on Monday, April 1, 2019, to take action on the 2020 Census by contacting your state lawmakers to share with them how important an accurate 2020 Census is to all Pennsylvanians. Without action, Pennsylvania could lose millions in federal funds. An undercount of just one percent would cost Pennsylvania over $221.8 million, or $1,746 per person, in Federal Medical Assistance Percentage (FMAP) guided funds alone each year for the next ten years. Learn more about potential consequences of a Pennsylvania undercount and FMAP by clicking here. With Census responses being collected online for the first time amidst lower levels of federal funding than in previous years, Pennsylvania is at particular risk of an undercount in the 2020 Census. This potential undercount could be due to: a disproportionately older population that is likely to struggle with online collection of responses; large rural areas with limited broad band access; and a high proportion of traditionally hard-to-count communities. According to a Penn State University study, more than 800,000 Pennsylvanians lack access to broadband internet. Twenty-four counties in Pennsylvania are being targeted to ensure an accurate count in each of these “hard to count populations.” It is particularly important to reach out to lawmakers in these counties to ensure an accurate count is prioritized. There are three tiers of priorities. Contact your state representatives and senators (click here to find your legislator) and ask them to prepare for the 2020 Census by allocating a small amount of money in the state budget to establish a public fund that would support public education, in-person outreach, and direct assistance in order to ensure a complete count. Pennsylvania should invest one dollar per person, or $12.8 million, in evidence-based strategies that will ensure an accurate count.